Want to raise honest kids? Don't lie to them or in front of them, more tips here. When parents lie to their kids it is often for good reasons; a topic is scary for the parent and/or for the kid or a parent foresees that a little bit of information will raise a lot of difficult questions (see this blog post for a hilarious example of the latter). But lying to kids is a losing proposition. First of all, it is a pretty good way to ensure that they will lie to you and to others. Being honest with and around your kids is the single most effective tool you have to teach them honesty. But there are other, related reasons not to lie to kids even when it is hard. By about five years of age kids will begin to keep track of how reliable you are in giving them truthful information about the world. They will weigh your past record of truthfulness when deciding whether to believe what you say or not. That includes when you tell them; "Smoking is bad for you," or "There aren't any monsters in your closet" or "I love you and I will always be there for you." Parents are the most important instrument kids have for making sense of their world. Having a parent you can't trust is like trying to find your way in the woods with a compass that only works half the time. Kids need to feel safe with their parents and part of safety is consistently helping to make sense of the world. The English psychiatrist and family therapist John Byng-Hall wrote a wonderful article about secure attachment in families in which he talks about the correlation between parents' ability to tell the story of their lives and the feeling of safe attachment in the family. There are two caveats to the rule of honesty with kids. One is, honesty should serve the child and not the adult. Adults shouldn't use kids as confidants simply to unburden themselves. This requires adults to have some capacity for self-reflection and some parent-child boundaries. And two, the information we give kids needs to be age appropriate. "Age appropriate" is a funny term. It's easy at the ends of the spectrum: a five year old can know that animals die, no five year old should see videos of beheadings. But it gets tougher to find two "experts" who will agree on what is age appropriate when you get to more complicated questions. This takes me back to what I said at the beginning; parents often lie to their kids for good reasons, because they don't want to impose their hurt and fear on their kids or because they don't have any idea about what how to deal with something hard in an age appropriate way. But secrets have a way of coming out. 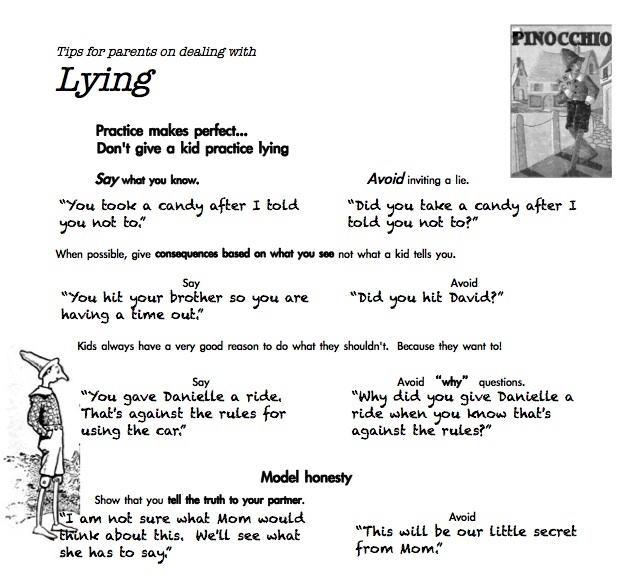 Here are some tough calls about honesty with kids. A ten year-old asks her/his parent about a family member who died before he was born, not knowing that person was murdered by another family member. What should a parent say to an anxious 8 year-old who hears about an abducted child on the news? What should a parent say when his/her ex reveals to their 12 year old that the marriage ended because of an affair? If the child has younger siblings these questions become even more complicated because a parent should not impose secrecy on the elder sibling and cannot expect a kid to finesse "age appropriate" when it is near-impossible for an adult to swing. So what do I do with clients in similar circumstances? First, I try to remember that I don't have to live with the consequences of the decision to be honest and that my clients do, so the client has to feel reasonably okay with his/her call. Second, I advise erring on the side of honesty because it's better for your child to have a reliable guide through an uncertain world than a paper-thin veneer tacked over life's hardest questions and a guide who they aren't sure they can trust. "Deborah was killed by Andre. He was very sick at the time." "It is very rare but sometimes adults do want to hurt kids, that's why your dad and I take good care of you." "Yes. I had an affair. I made a really stupid mistake." (This final one is the trickiest. A child in this circumstance will inevitably want to insert him/herself between the parents. The parents need to give the child the message that adults take care of adult problems, but I think that a short clear statement taking responsibility for infidelity in that circumstance is better than leaving it to a kid's imagination and doesn't invite the kid to step into the role of co-parent). After these truthful, succinct, yet complete, relevant, and clearly presented explanations, the parent needs to say, "And if you want to talk about it more now or later we can. There may be some things I may not be able to tell you but you can ask anything you want to." Then shut up and listen like you have never listened before.